It seems my back yard has a new resident. I was at my home in the country this weekend and several times when I looked out the window, I caught site of this wild turkey . 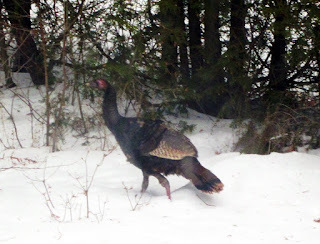 (One time, I was pretty sure I saw two wild turkeys, so maybe a new family has moved in.) More than once, I ran for my camera and tried to get a picture, but he (or she?) was quite wary and disappeared quickly. Finally, I managed to get a picture of him, but he seemed aware that I was at the window and was obviously camera-shy. 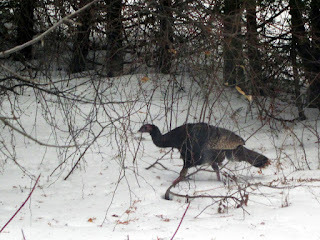 He was a very large bird and left tracks in the snow longer than my hand. This is the bit of bush where the turkey ran to hide. 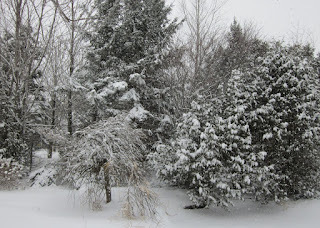 As you can see, we had a lot of snow this weekend. It was very picturesque but also treacherous for driving. I, for one, am looking forward to the snow all melting and the return of warm weather with the arrival of Spring! Nice turkey pics! How exciting to see a wild one! Cool shot! 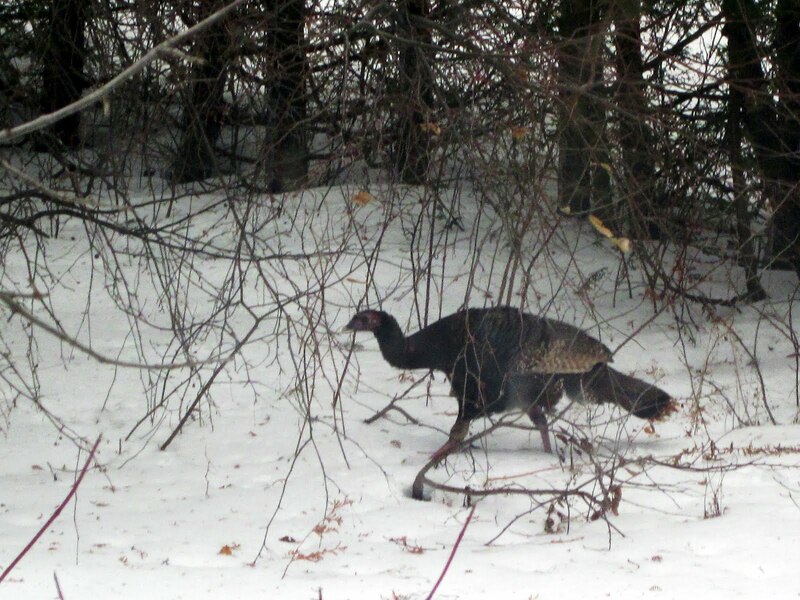 Love those wild turkeys! Great turkey shots!! I've seen a lot around here this winter. Wonder if it's a good year for turkeys? I'm kind of hoping it's a very bad year for turkeys, at least in Toronto!